↑ D., Luis (8 May 2017). "Lots of Snapdragon 835 Galaxy S8 units apparently have UFS 2.0 instead of newer UFS 2.1 memory. Should you care?". PhoneArena. पहुँचतिथी 13 May 2017. ↑ Smith, Chris (8 May 2017). "Samsung may have lied about how fast the Galaxy S8's storage really is". BGR. Penske Media Corporation. पहुँचतिथी 13 May 2017. ↑ "Samsung Galaxy S8 Specifications". Samsung. पहुँचतिथी 30 मार्च 2017. ↑ "See the Samsung Galaxy S7 camera and its blazing fast autofocus in action". PhoneArena. पहुँचतिथी 28 July 2016. ↑ "Galaxy S8 and Galaxy S8+: The full specs". पहुँचतिथी 30 मार्च 2017. 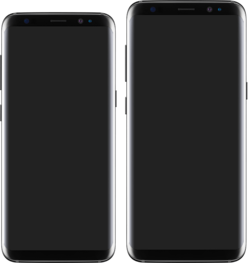 ↑ "Samsung Galaxy S8 Plus vs iPhone 7 Plus: which is better?". Techradar. पहुँचतिथी 3 April 2017.